Encore Beach Club requires an equal number of women, or more women than men, for all men to be eligible for the guest list. Encore Beach Club Las Vegas, or EBC as it is known as, is a massive 60,000 square foot pool party central in Las Vegas. Located at the Encore Hotel & Casino this dayclub is luxurious, vibrant, and one of the most popular location on the strip. 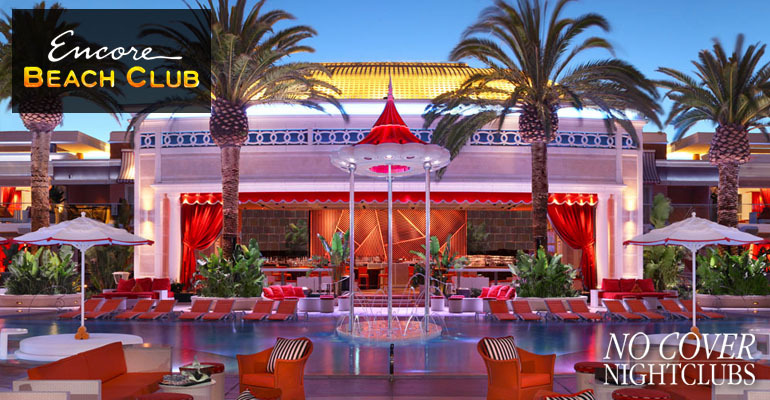 With three pools, multiple bars, cabanas and daybeds, thousands claim EBC each and every weekend. The massive bungalows offer high-end seating with private infinity hot tubs, private bathrooms with showers and temperature-controlled cooling systems. Guests preferring a more close up view of the pools can choose to lounge on oversized lily pads floating in shallow water or dance under one of the shower poles. Encore Beach Club also offers a gaming pavilion beckoning guests to take a break from the desert sun and try their luck at the blackjack or craps. No detail is overlooked, as Encore Beach Club also features a custom audio system designed by John Lyons Systems to withstand the outdoor elements while delivering exceptionally rich, clear sound. This outstanding sound system paired with chart topping acts, superstar DJ’s and surprise impromptu performances. A few artists off of the exclusive residency list for Wynn Las Vegas are world class DJ / producers: Tiesto. Deadmau5, Afrojack, Calvin Harris, Dada Life, Steve Aoki, Steve Angello and Sebastian Ingrosso to name just a few. Encore Beach Club also features its own grill available to all patrons, while cabana and bungalow guests are able to indulge in flavorful fare from a daytime menu of fresh salads, hearty sandwiches, wraps and BBQ items served in the restaurants main dining area and on the new 1,200 foot outdoor patio. If you are looking for a Encore Beach Club promoter you have landed in the right place. Those looking for Encore Beach Club bottle service, table reservations, pricing, and menus can connect directly with a EBC VIP host here. The entrance to Encore Beach Club can be found near the front of the property on Las Vegas Blvd near the Wynn parking garage. Know that the line for this popular pool party starts early and the entrance will fill with people. Please arrive early. How Much Is Encore Beach Club Cover Charge? Dress code is required to ensure entry into EBC Pool, especially for men. To avoid any problems getting into the pool party it is recommended that everyone wears pool attire. Men should have swimsuits. Know that pool parties do not usually allow cargo shorts, athletic shorts, jeans, or jerseys. Hats and sandals are of course allowed. Check out more tips for Las Vegas dayclubs. 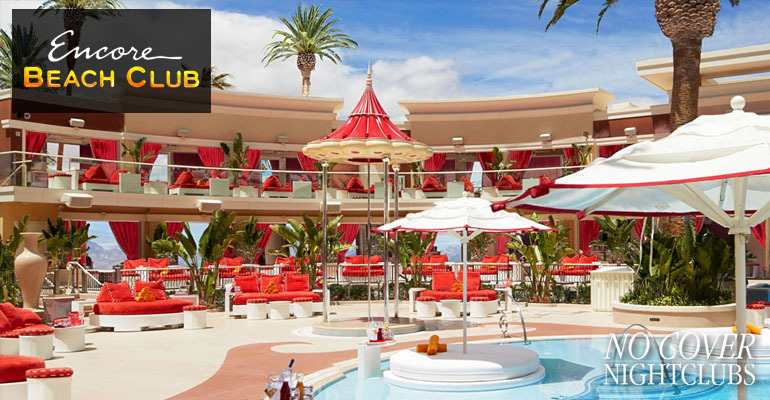 Encore Beach Club has created a plush environment where you can mingle all day. While it is very spacious it does get crowded, and that is no surprise because it is Las Vegas and they have the world's best DJs. The sound system is great and the pool is refreshing. Encore Beach Clubs owns summer.